When it comes to organising your Surrey wedding day, finding the perfect wedding band can be one of the final, most important factors. The ideal Surrey wedding band will get everyone up dancing, from flower girls to Great-Aunty Jean, giving you special moments and long-lasting happy memories. The Supertones truly epitomise great wedding entertainment. Not only do we aim to play some classic tunes that will have everyone on their feet partying into the night, we make sure that we keep our repertoire classic and fresh, so your wedding doesn’t become a typical cliché. We are four local lads from Surrey who promise to deliver at your wedding and give your guests a night to remember. We’ve all been to the occasional lackluster wedding with an average band blasting out the same old tunes. There are plenty of this type of band out there, but we strive to be different. Us Supertones are an indie, rock and pop band with years of experience in the music industry. We’ve not only played at weddings, but at some incredible live venues such as The Clapham Grand and Islington Academy. We are four guys who really love to make music together, so our rapport on stage (and with the bride and groom) really adds an extra level to our performances. 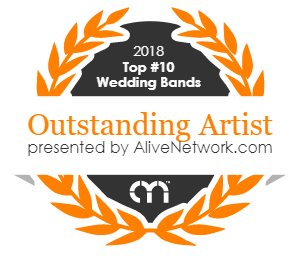 If you’re looking for a more contemporary edge to your wedding band and some infectious energy on stage, we’re definitely the right choice for you! A wedding set from The Supertones is no generic wedding set. Over the years, we've developed an intuition, through various musical projects, as to what it takes to get an audience partying all night. It's this skill that makes us so great! We want to make your wedding unique and perfect for you, which is why we have an incredible selection of awesome songs we love to play. From the 60s and 70s classics from Fleetwood Mac, The Rolling Stones and Stevie Wonder to modern hits from the Foo Fighters and Kasabian, all of our songs have an indie-rock vibe. But don’t worry, we love the 80s and 90s too! Some classic Reef, Radiohead, Nirvana and Oasis are sure to give your wedding an element of nostalgia and get everyone up singing and dancing along with us. We are always updating our repertoire and can tailor it to your specific wishes to give you a brilliant set to remember. If there’s not a song on there that you love, make a request with us at the time of booking and if we can’t play it live we’ll add it to your DJ set for you! We know that on your wedding day, you’re going to have 101 things going on and don’t want to worry about the band turning up on time. That’s why we are 100% professional, turning up in plenty of time and have mastered the art of getting set up whilst causing minimum disruption. We are four fun, friendly guys whose aim it is to give you a brilliant day and share some of the joy and happiness on your wedding day. This is why we are always well-organised and sociable so we can contribute to your happy day and hopefully make our performance a true highlight for you. The venues love us too! If The Supertones are starting to sound like a band you want to party with on your wedding day, get in touch now. Select your date and make an enquiry for an instant quote today. If you'd prefer to speak to someone on the phone, get in touch with our friendly, lovable agent, Marc at Alive Network, who will be only too happy to help. His number is 0845 226 3118 (Monday – Friday, 9-5). What do I need to do to secure this top Surrey wedding band? As a musically trained, passionate band, we're very self-contained and have all of our own musical instruments, clothing and kit. All you'll need to do is decide on an area where you'd like it to set up on the night! However, it is ever so much appreciated if we can have a little space to chill out when we’re not playing – we prefer to save our energy for when we’re on the stage! Also, the hen do has finished now ladies so the last thing you need is four men getting changed in front of you whilst you’re tucking into your evening buffet (if you could possibly even arrange for your waiters to bring us a little plate to share you’ll make four men very happy!). A room with a lockable door is ideal so we can keep our stuff out of your way. We’ve played at lots of brilliant venues in Surrey, but everyone’s set up is different, which is why it’s perfect for us if you could spare someone from your wedding party to meet us upon arrival to show us where you’d like us. If that person could also grab a member of staff to help us with the technical set up, that would be grand! Believe us, we don’t want to stop playing any more than you do, but some venues and local councils have music restrictions that prevent live music past midnight. This is why it would be great if you could make arrangements prior to the wedding day if you’d like us to play later so we don’t get you into any trouble! We’re happy to discuss late night rates with you if you would prefer us to keep playing, rather than move onto a disco. We also understand that sometimes your wedding day might end up running slightly behind schedule, normally due to a heroic reception to the speeches. We would love it if your appointed member of the wedding party could ask a member of staff to notify us if you’re overrunning so we don’t end up locked in a room with a plate of vol-au-vents all night! Luckily for us, due to great reviews and glowing recommendations, we tend to be very busy, especially on weekends! So if we seem like the right band for you, make sure that you get in there nice and early with your booking request. Plus it’s nice to be able to tick one thing off the ol’ wedding list! With your entertainment sorted, you can put your feet up and get back to that cake tasting. To book us, fill in the instant quote form on the Alive Network page and we’ll let you know if we’re available and our fee. Once you’ve filled in all of your details, plus any extra requirements, someone from Alive Network will get in touch with you to discuss your booking… simple! Why book via Alive Network? There’s one simple reason why we use Alive Network as the soul avenue to book The Supertones – they’re brilliant! They offer excellent customer service and keep us organised whilst we’re busy having a brilliant time playing at Surrey weddings. As well as being fast, friendly and professional, they always endeavour to offer you a personalised service – so we can deliver you a unique experience rather than a generic one. We like to give you one main point of contact so you can build a rapport and we can offer a personal service. We know that things can sometimes be forced to change due to unforeseen circumstances, which is why Alive Network also offer 24 hour emergency cover. We accept many payment options for your convenience. We keep your payment details safe and secure, so you don’t have to worry about your security being compromised. Alive Network also sign all of our comprehensive contracts ourselves. So book The Supertones today to guarantee a professional, fun, energetic wedding band that are sure to inject some fun into your night and create lasting memories forever. We can't wait to party with your wedding guests!